The following pictures are all taken by me, Ebbe Holsting, and are copyrighted. However, should you wish to use them in any way please contact me for permission. Thank you! By clicking any picture a larger version will open in a new window. 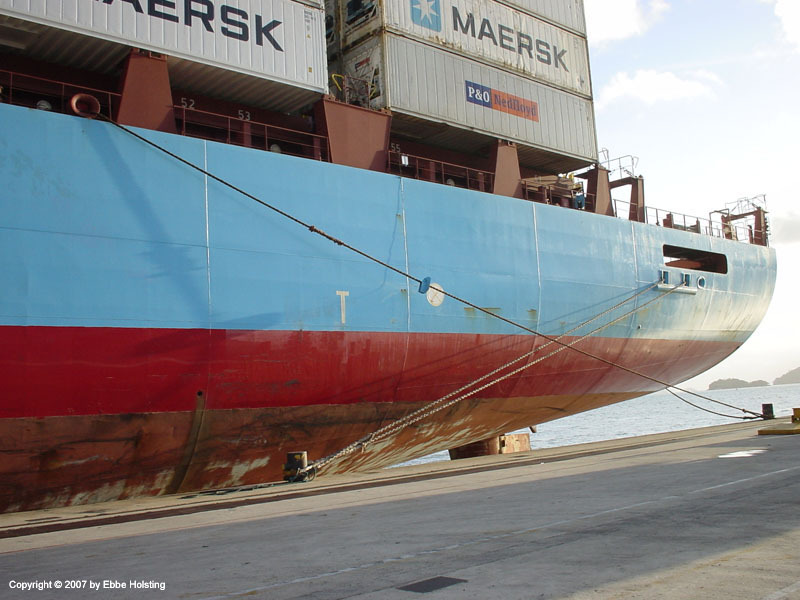 The M/V "Leda Maersk" alongside at Algeciras, Spain. 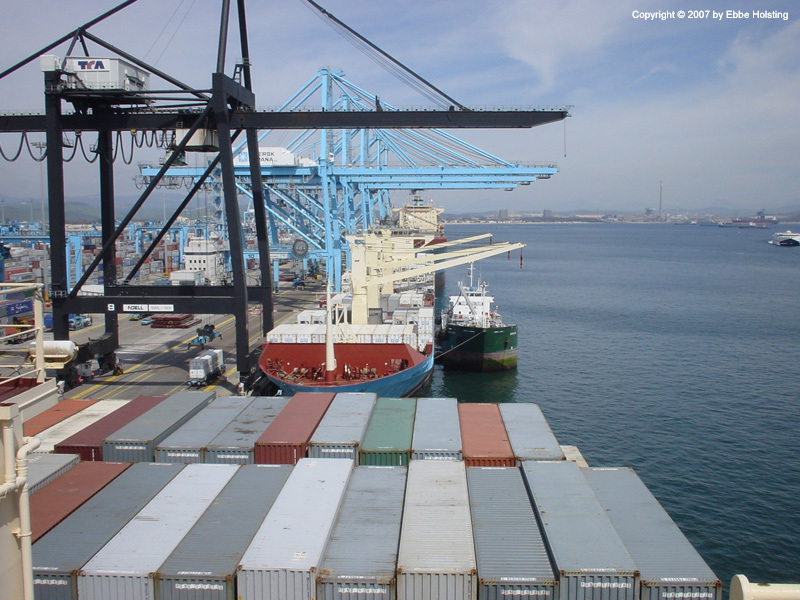 Algeciras is one of A. P. Moller's biggest container hubs, and is called by container ships from a great number of different routes. 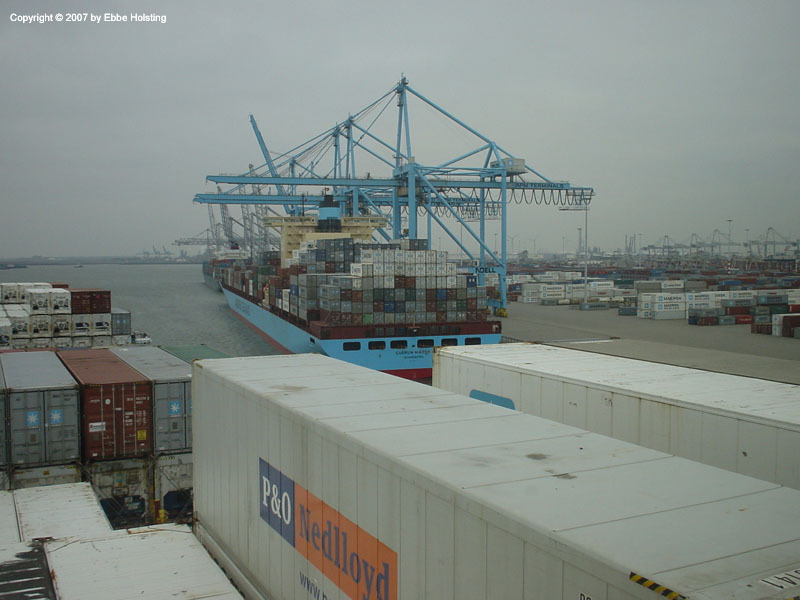 Notice the huge number of white containers loaded on the Leda Maersk. These are reefer (cooling) containers. 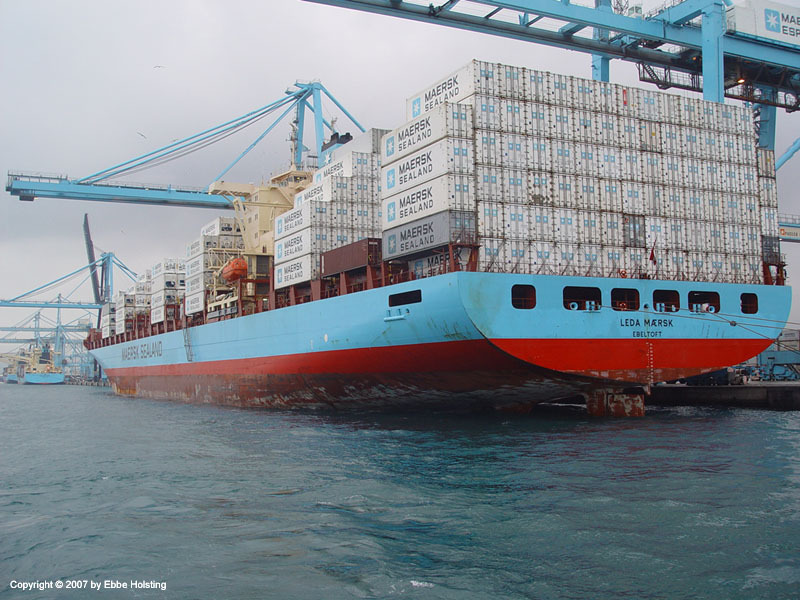 When calling Algeciras north bound coming from South America, the vessels typically carry large numbers of reefers loaded with tropical fruits and other goods needing refridgeration. When calling Algeciras south bound, a large number of empty reefers are loaded for transport back to South America. Still at Algeciras, we are here looking aft from the Navigational Bridge. The smaller container vessel aft of us is accompanied by a smaller vessel berthed at its side, most likely a bunker barge. Bunker barges bring fuel oil to larger vessels for bunkering (refueling). My cabin onboard. 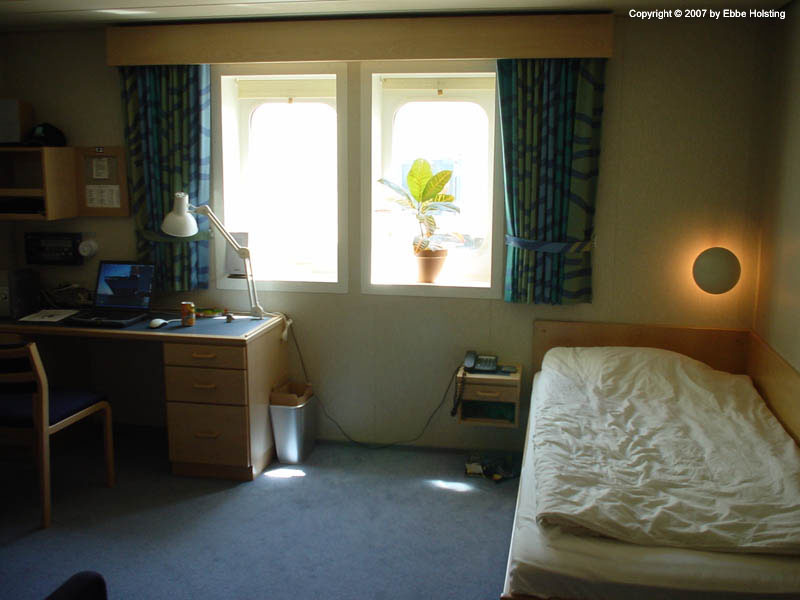 Size and facilities are typical for a junior officer cabin. Apart from what is visible here, the cabin has a sofa and an armchair, as well as a bathroom with a shower and toilet, and a warddrobe with a closet. Senior officers (Captain, Chief Officer, Chief Engineer, 1st Engineer and Chief Cook) all have larger cabins. 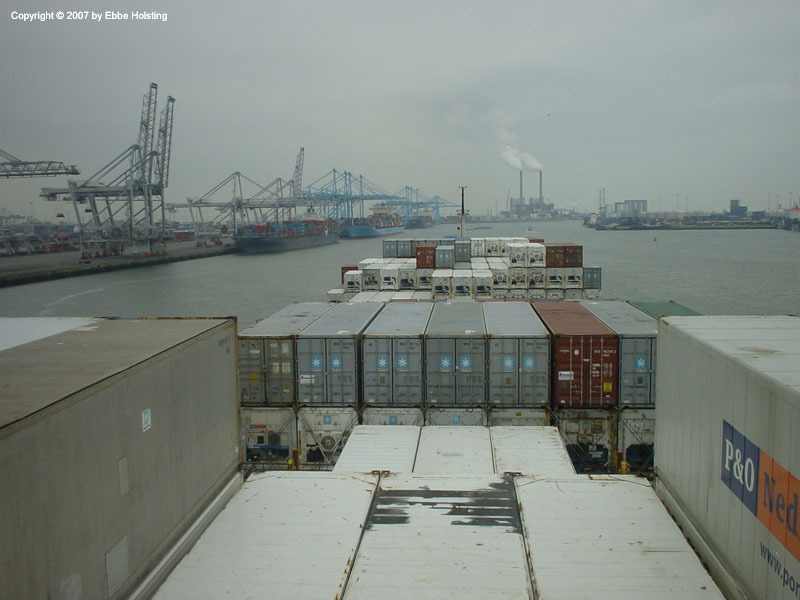 Approaching the APM Terminal at the Port of Rotterdam, one of the largest ports in the world. When entering and departing harbour, a local Pilot boards the vessel. The Pilot has a vast knowledge and experience of the local waters, and with these assists the Captain in his manouevering of the vessel. Contrary to what most people believe, the Pilot does not assume command of the vessel. The Captain is a all times fully in charge of the ship. Passing the "Gudrun Maersk" already berthed at Rotterdam. 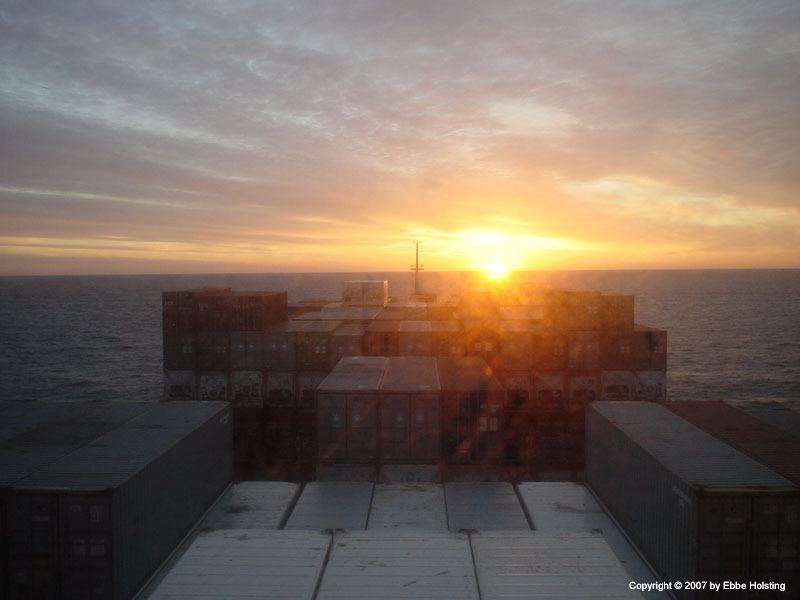 At this point we were manouevering backwards in order to berth aft of the Gudrun Maersk. At the time of this picture, the Gudrun Maersk and its sister vessels (A. P. Moller's G-class) were the largest container ships in the world. 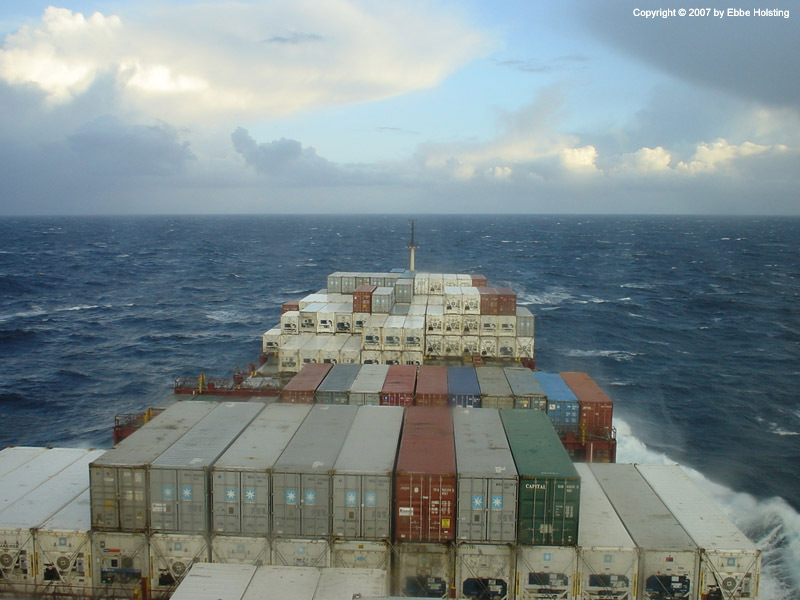 Now (2008) they have been overtaken by A. P. Moller's E-class container ships. 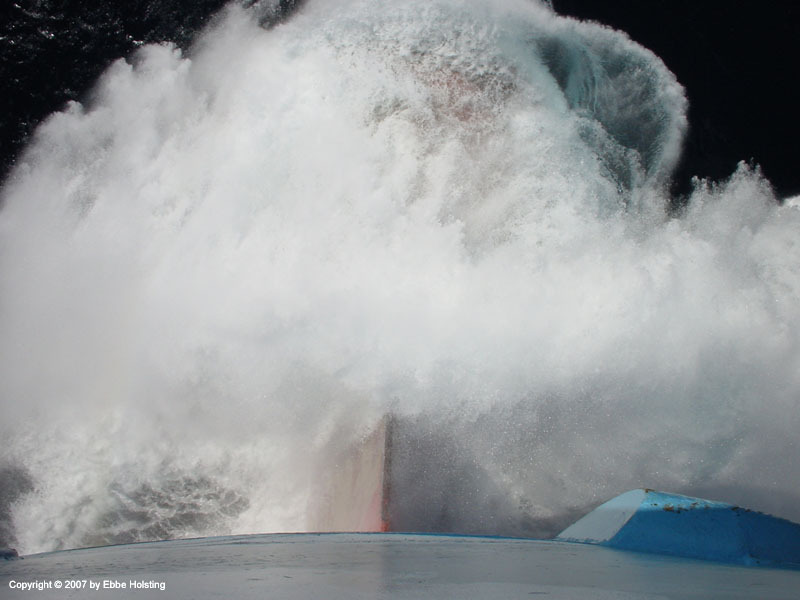 Steaming at full speed with the bulbous bow only partly submerged. The bulbous bow, which has been developed through the study of whales, improves the hull's aquadynamics, thereby saving fuel expenses. 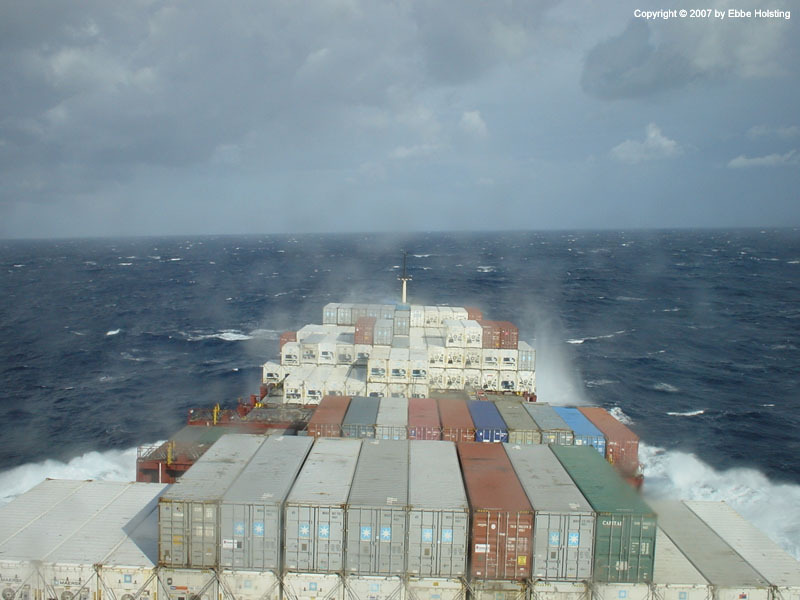 In the Bay of Biscay (the waters west of France) the seas often get a little rough. Although not actually too rough in these pictures, the angle of the waves was rather unfortunate and caused the ship to roll from side to side. The weather calming down as the sun sets over the ocean. 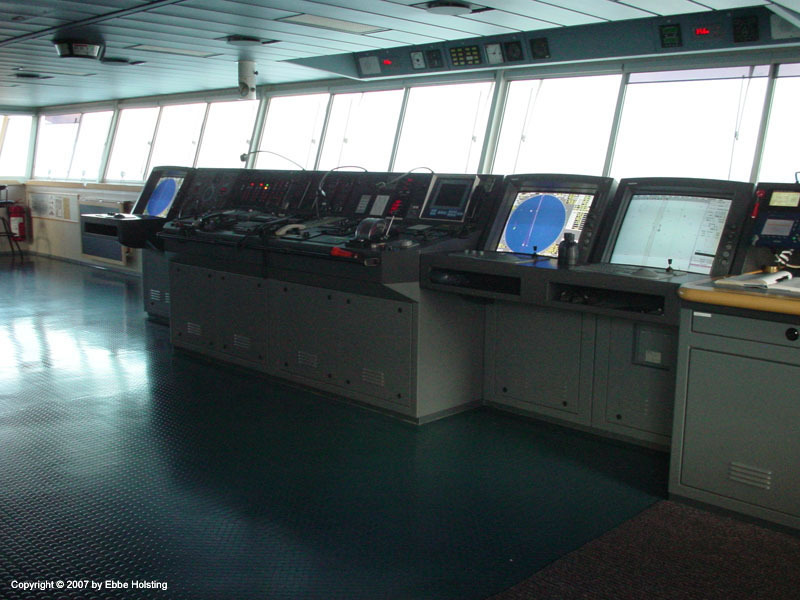 The navigational bridge, also called the wheelhouse. The larger white screen to the right is the electronic navigational chart. In the future such electronic systems may totally replace the typical paper charts, but as of yet the electronic charts alone are not approved for navigation. The two other screens with the blue circles on the display are the radars. 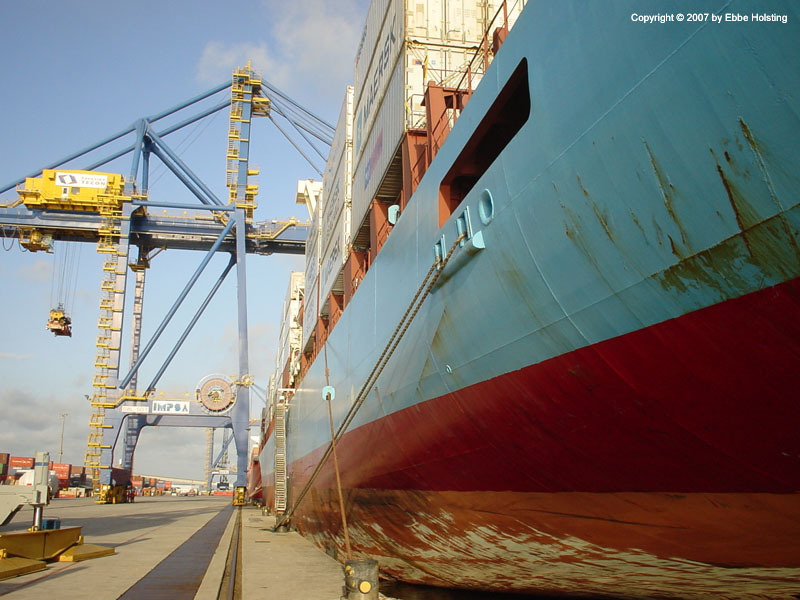 Having crossed the Atlantic Ocean we arrive at Sepetiba, Brazil, a container terminal not far from Rio de Janeiro. 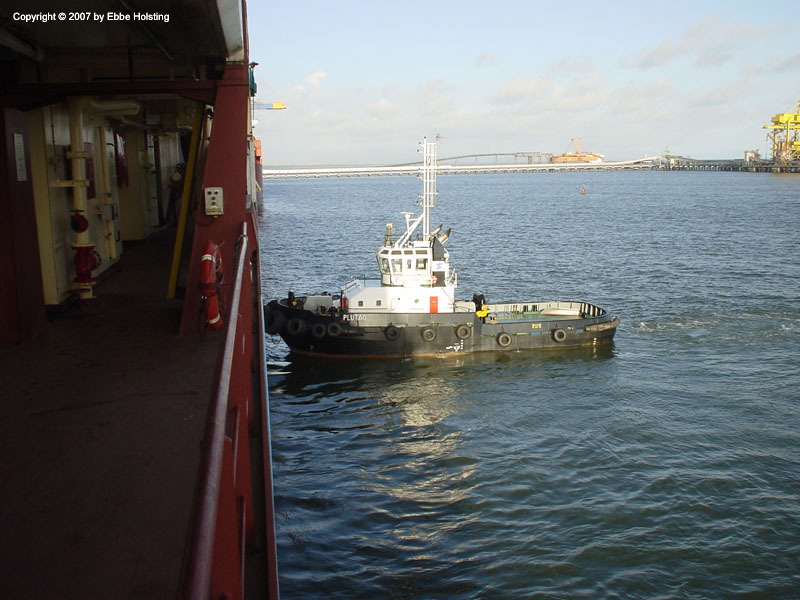 Tugboats guided by radio communication from the bridge assist with the vessel's berthing. 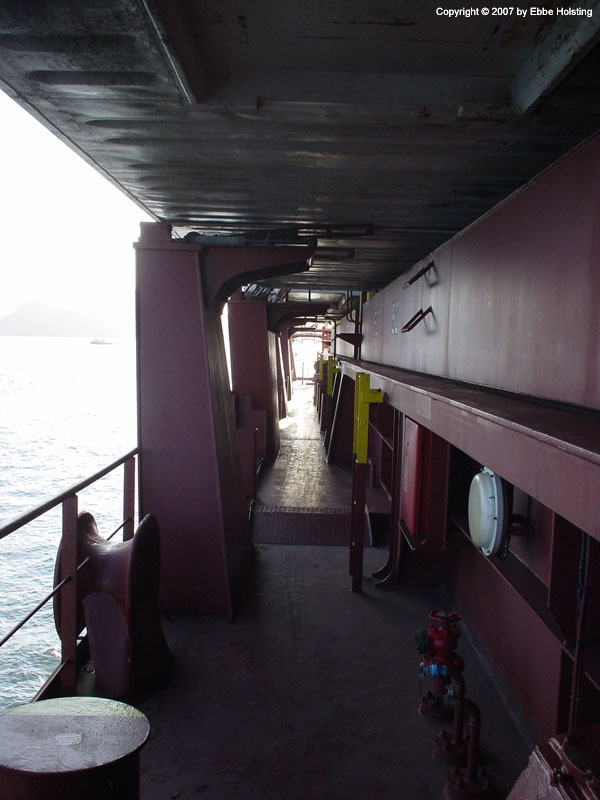 The gangway is lowered to allow entry to the ship. For safety purposes a net is secured around the gangway. When calling a harbour, the local agent usually boards the ship as the first person from ashore. He is followed by a cargo planner from the harbour and usually immigration authorities also come for a visit. The officer of the watch is usually one of the first persons to go ashore, and he does so in order to read the vessel's arrival draft fore and aft. Berthed at Sepetiba, with port side alongside. Same view but from a little further aft. The paint on the ship's hull is beginning to look a little worn. 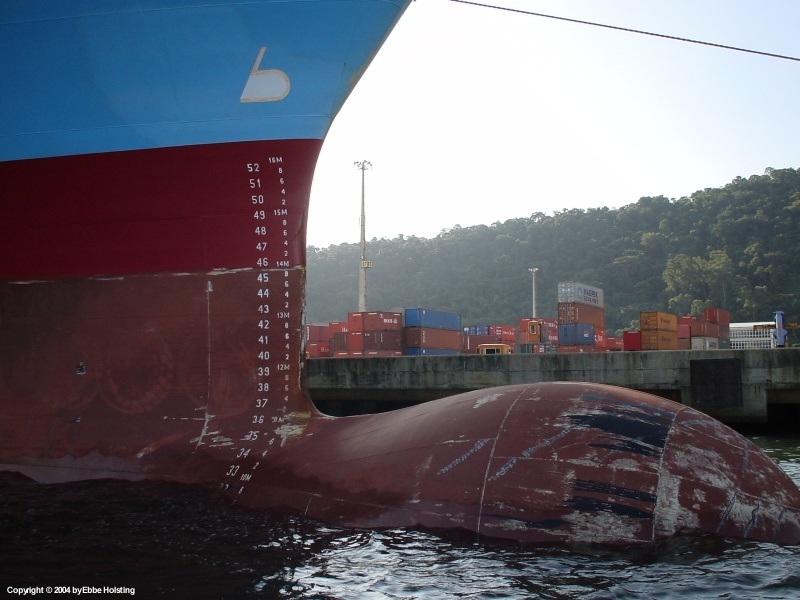 A. P. Moller vessels are typically docked every 5 years, and the entire hull is repainting during these dockings. Notice how the brown paint on the bottom part falls off, revealing the white color underneath. This is actually the intention. The brown paint is designed to fall off slowly in order to avoid algee growing on the hull (socalled "fouling" of the hull). The pier was almost too short for our good vessel and called for some creative mooring. The bollard visible to the right in the picture was the last bollard on the pier, so we had to take the stern line out through a fairlead in the passageway in order to get som holding power out of it. The two ropes going from the mooring deck and to the left (forward) are called the aft spring lines. 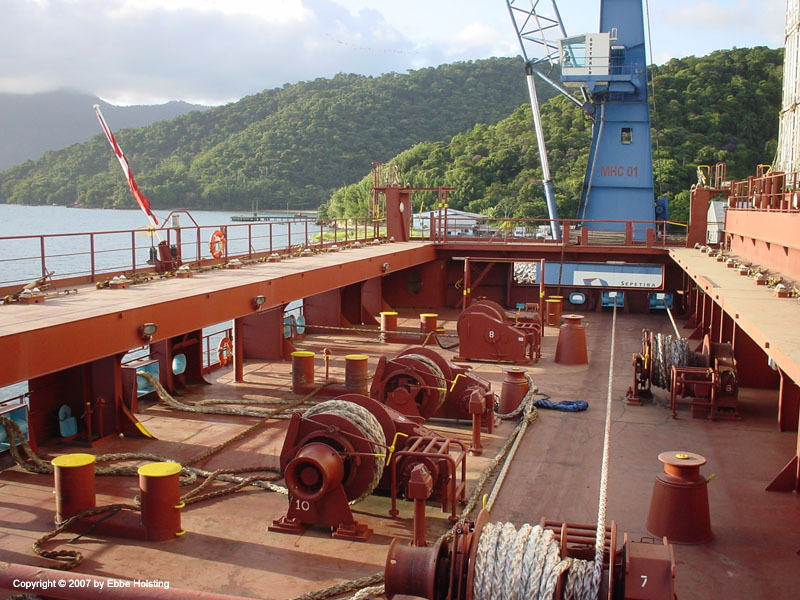 A view of the aft mooring deck while berthed at Sepetiba. The two winches positioned longditudinally (no. 6 and 7) are typically used for the spring lines, and the three others are used for the stern lines. The three visible capstans (the cones with a horizontal wheel on top of them), however, allow for alternative usage of the winches. 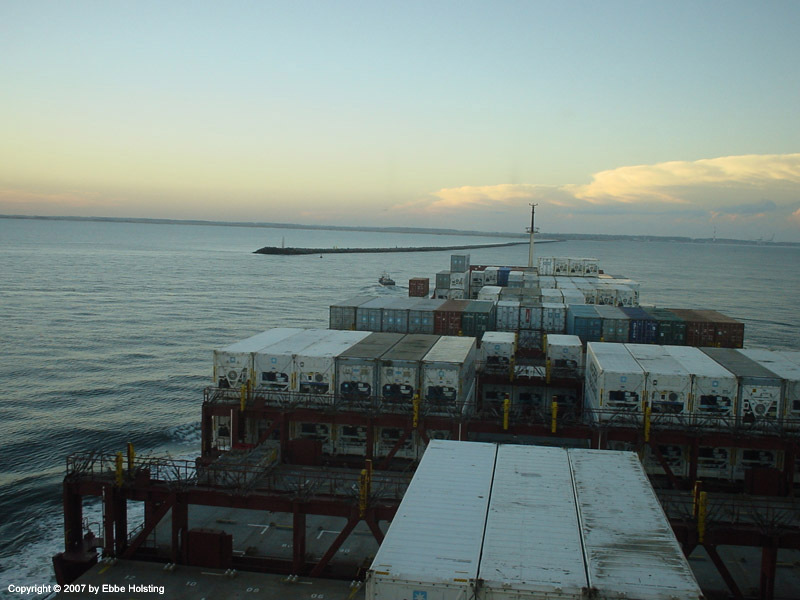 Cargo operations proceeding at Montevideo, Uruguay. 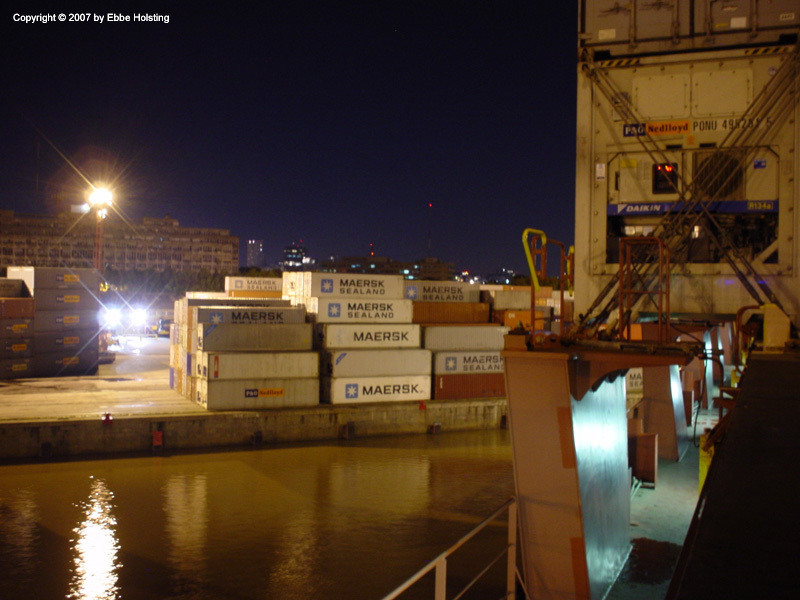 In Europe and South America the cargo operation is planned ashore by the cargo planner in each port, however in some areas (e.g. the African west coast) the ship's officers plan the operation. In this picture, notice the lashing equipment located on the top of each lashing bridge (red structures). A look athwartships in between two hatches. 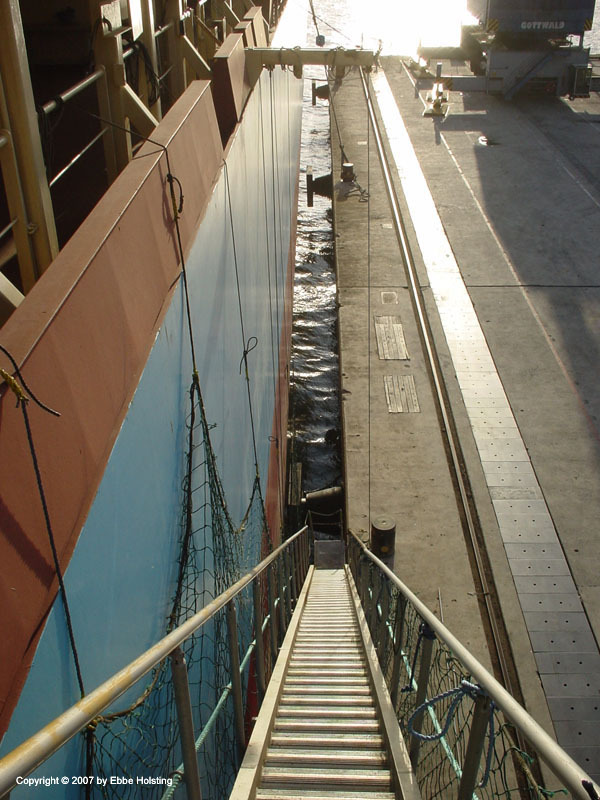 These passages are called "catwalks" and contain entrances to the cargo holds, ladders leading up to the lashing bridges, reefer power plugs and cargo hold ventilation shafts. 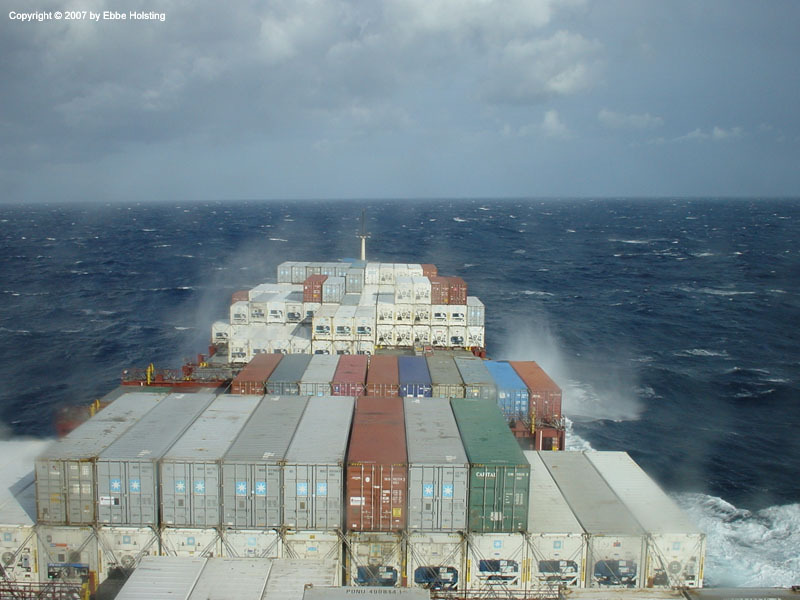 Containers lashed on deck. 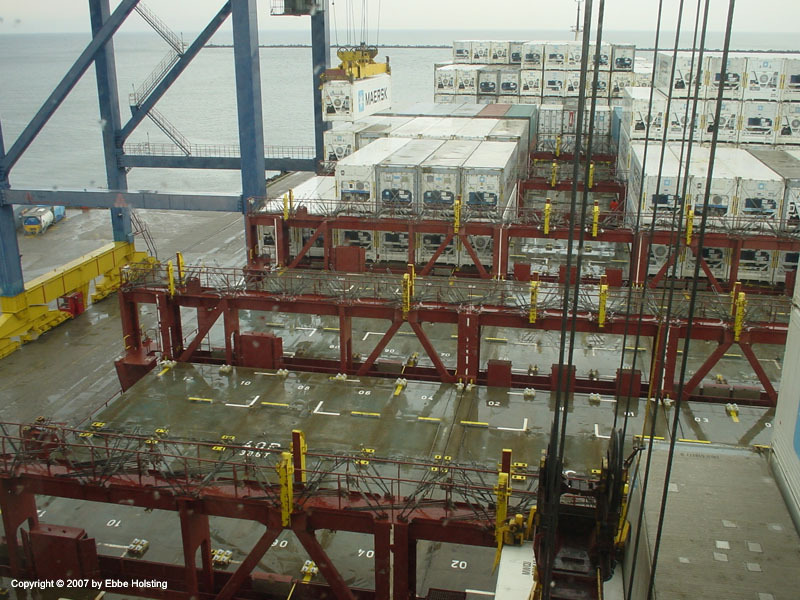 The bars crossing each other in front of the containers are the lasing rods. 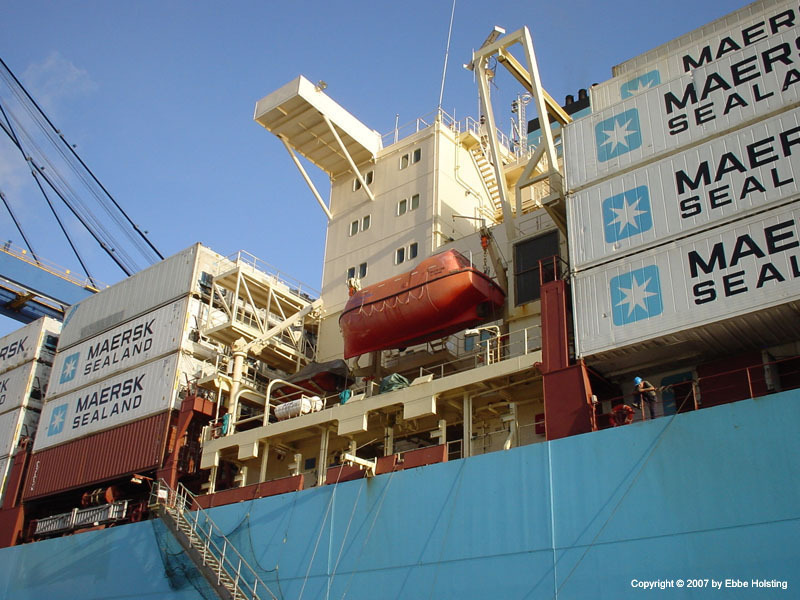 Lashing workers from ashore usually carry out the lashing and unlashing of containers. 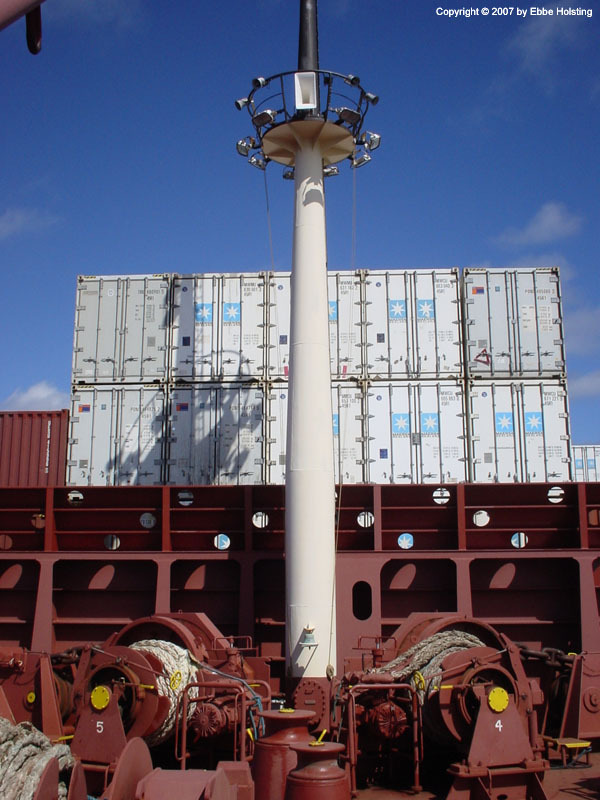 All containers on deck are further secured in each corner to the container beneath / above it by a device called a "twistlock". 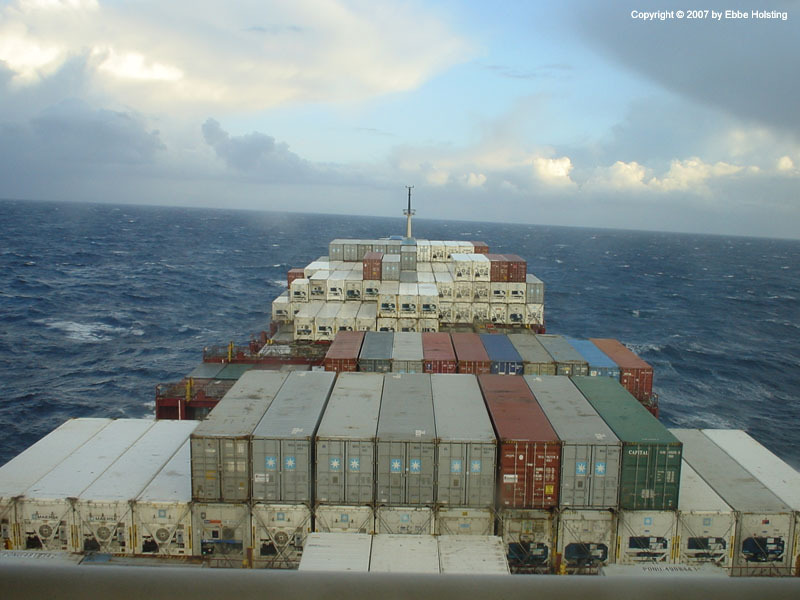 Another view of a container lashed on deck, in this case a P&O Nedlloyd reefer container unit. The red light visible on the container is a little display showing the temperature inside the container. 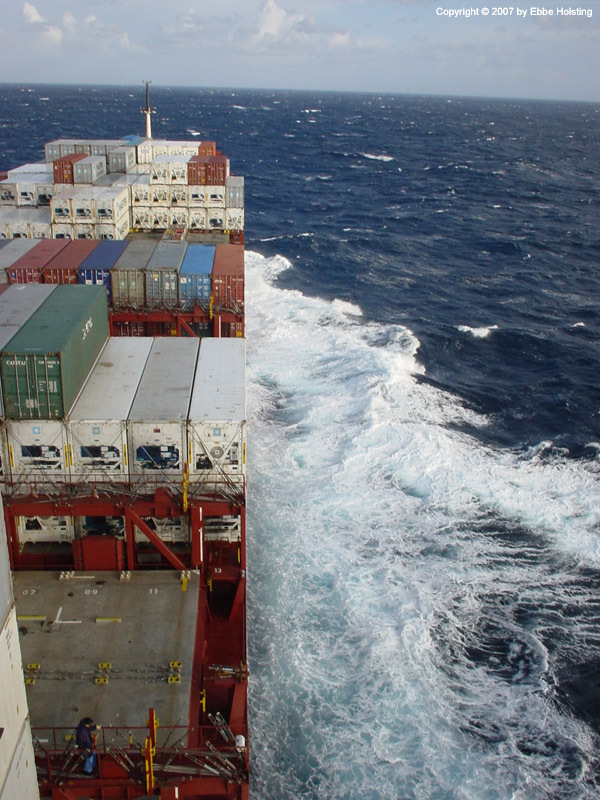 The reefers are powered by the vessel's power supply, and the daily survaillance and maintenance is carried out by the ship's electricians (one or two electricians on board depending on the average number of reefers carried. 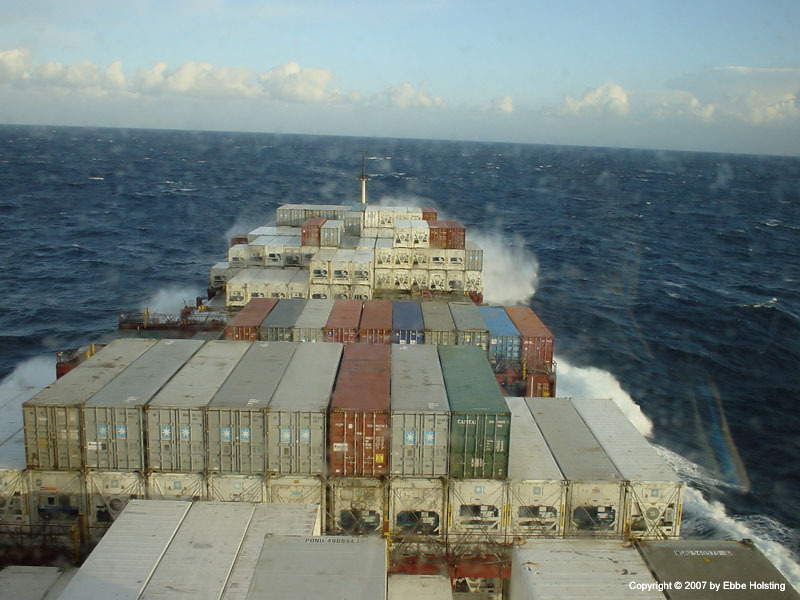 Reefer containers loaded abaft of the accommodation. 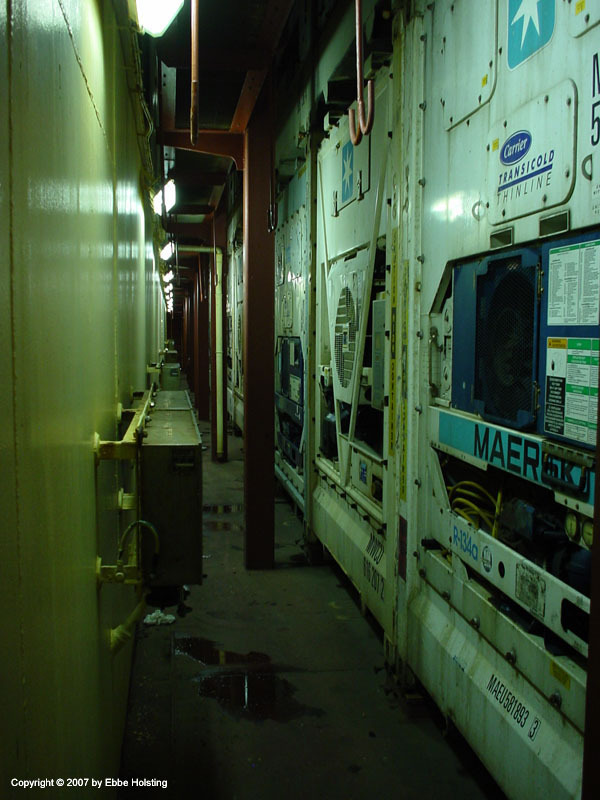 The grey things to the left are power distribution boards containing power outlets for the reefer containers. 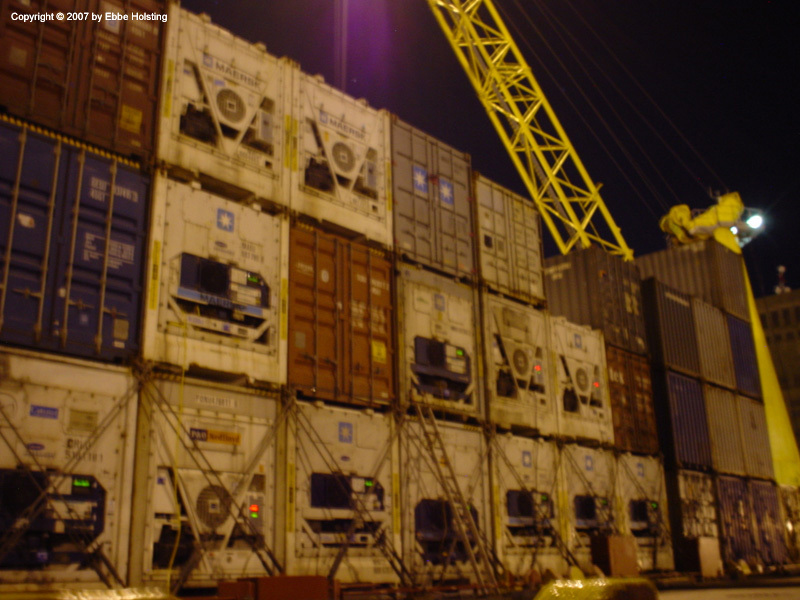 These containers, however, are not plugged in, either because they are empty or because they are about to be discharged from the ship. 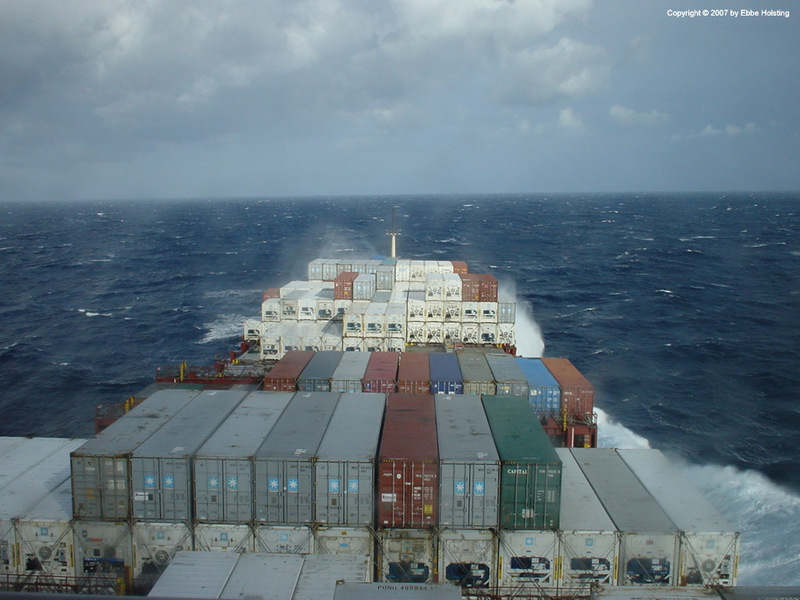 A reefer container is supplied with 440 Volts from the vessel's own power system. Looking aft in the starboard side upper deck passage way. 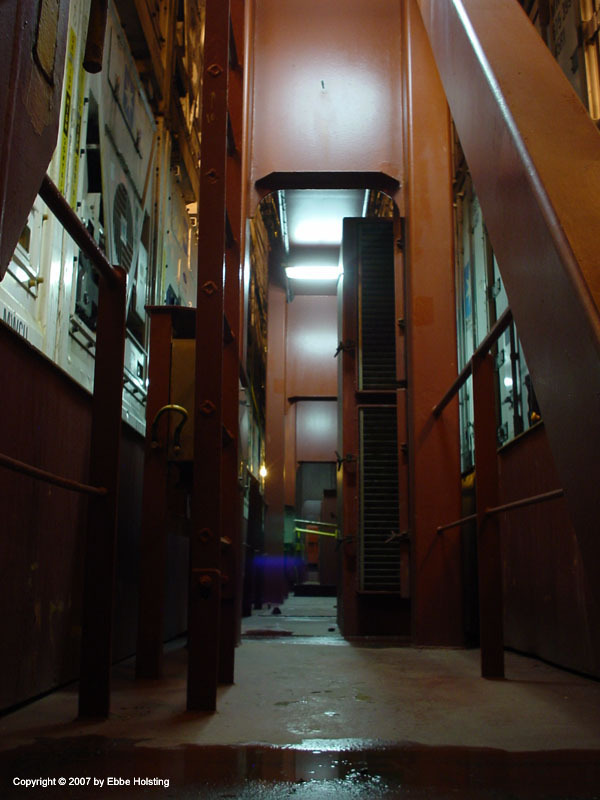 The "roof" is actually the bottom of a container, and the vertical "wall" to the right is a hatch cover resting on the hatch coaming of a cargo hold. In the bottom right corner we see a fire hydrant (red outlet), a fresh water outlet (blue) and a compressed air outlet (grey). These are located at even intervals on deck. Fresh water is used for cleaning, and compressed air is used for air-driven tools, e.g. grinders, rotating steel brushes etc. The mooring equipment on the ship's forecastle (bow section). On the L-class container vessels each mooring winch can pull with about 25 tonnes. 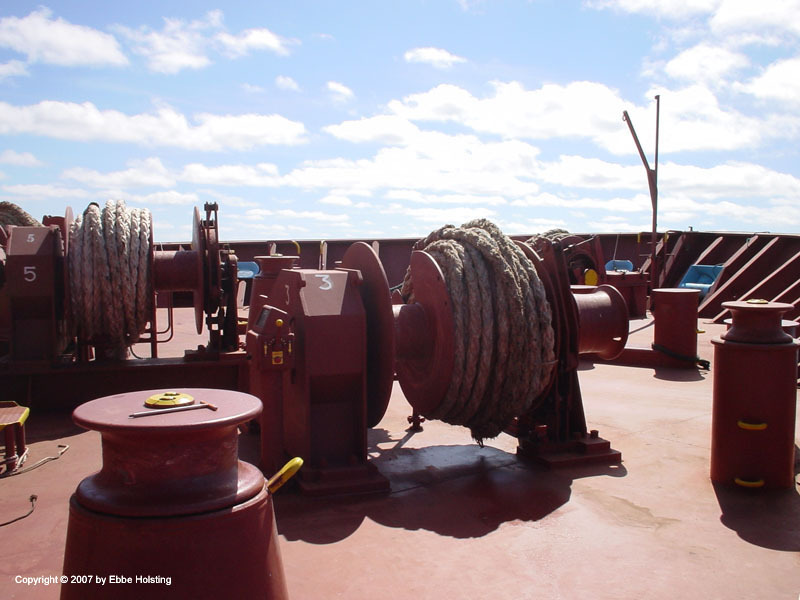 The ship's are equipped with 5 winches in the bow and 5 in the stern. The horizontal wheel in the bottom left corner is a capstan used for guiding the mooring ropes out of different fairleads. During mooring operations each mooring deck is manned by an officer and two ship's assistants, with the officer controlling the winches whilst keeping up radio communication with the Captain on the bridge. The assistants handle the mooring ropes. Looking aft from the bow of the ship, viewing the foremast. Years ago lookouts were stationed in the foremasts of ships, but today the mast only carries some navigational lights, a radar scanner, and as in this picture: a signalling whistle (the white square thing in the top of the picture). The mast is also equipped with flood lights for lighting up the forecastle during mooring operations at night, as well as loudspeakers for the public address system. The brass bell near the bottom of the mast is a tradition, and serves no real purpose on today's ships. Bells are used for signalling, but the sounds are generated digitally (artificially) today. The winches on the L-class vessels are driven by electric motors. Winches no. 4 and 5 are visible in this picture, and are a bit special because they are the two winches used for driving the anchor winch drums. 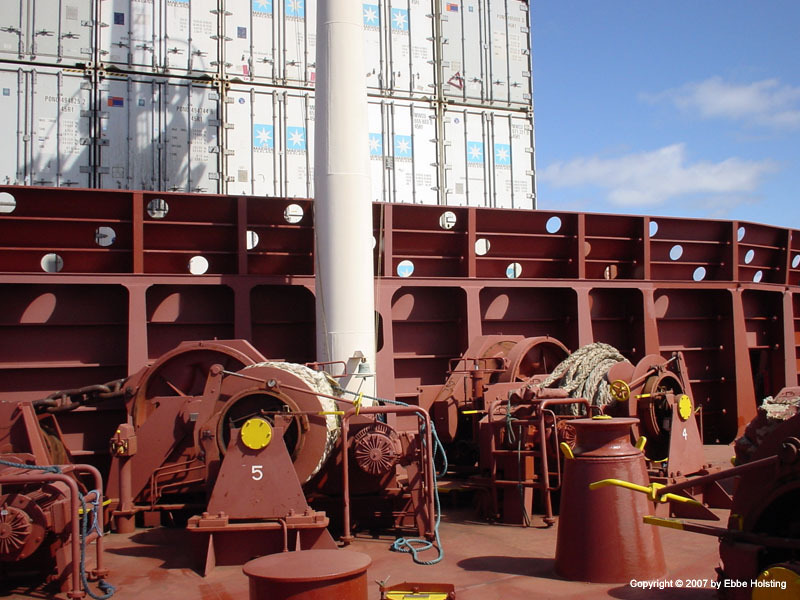 The anchor drum and the mooring rope drum can both be engaged / disengaged by a number of clutches. The anchor chain itself is stored in a huge locker below deck and runs through a chain pipe to the winch drum. Entering the port of Rio Grande, Brazil. The little fishing boat visible to the left of the ship got alarmingly close, but collision was duly avoided.